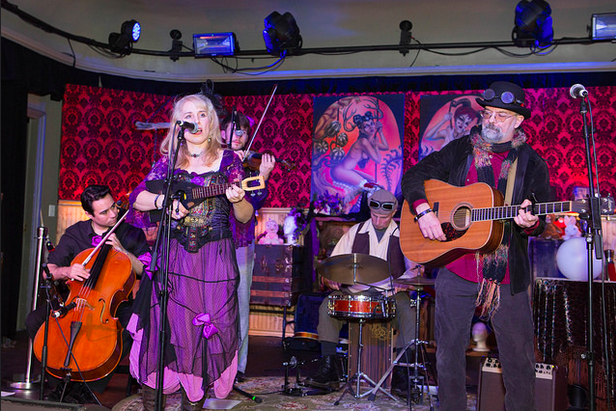 Alzara and Brother Spellbinder help to create the perfect muscial ambience for the Edwardian Ball. Photo Credit: Ruby Rieke. On the train to the 17th annual Edwardian Ball I’ll garner a second glance or two. My early century bowler hat could throw off someone’s father, reminding him of his father. My vintage coat might rouse some suspicion. It isn’t the murder mystery the N-Judah was hoping for. It seems everyone is either headed to, or from, their beds. Their eyes are washed raw in the disappointments of the day. I hoped to replace their resignation with my early nineteenth century fashion. I’m tugging on their eyelashes and whispering, run away, please, run away with me. The Edwardian Ball isn’t about you, until you look in the mirror. You didn’t know your smile got that close to your ears until that last corset row snapped you into place. New costume, new me. We catch joy in the mirror as our toes jump without asking us, and we’ve never felt more like ballerinas. We crossed the Regency Ballroom’s threshold like we robbed Fort Knox and danced through the metal detectors. I stole wonder, I stole denial, I stole wit, she stole articulation, and he stole bravery. It was ours for the taking, it came with our tickets. This year’s Edwardian Ball played dystopia on the top floor, murder in the middle and lucky for us, supplies to survive both brilliantly, at the bazaar in the basement. The Deadly Blotter, a twenty-six word story, written alphabetically by Mr. Gorey, ruled the night as the middle floor main course. The players moved as one hilarious mime troop, their every action accented by Rosin Coven’s sideshow musical antics. I respond, trust me, it’s not the same event year after year. While my mind washed in the absinthe of the night, I reveled in this confusion. We don’t know where we are going, but we know there will be artists there. We don’t know who we are when we put on these new costumes, but we sure look good in lace and leather and that one girl in that red dress is dancing like she’s finally free. The Edwardian Ball is a world unto its self. It is created year in and year out by the fabric of it’s nature. Where else can you have tea in the bosom of a twenty foot tall woman’s dress? Or take in all macabre movies, all the time, at their cinema? It is an escape no doubt, and when backed by a community of artists, it is one that evolves. Next up comes the evolution of the 8th annual Los Angeles Edwardian Ball on February 11th. Then the first ever New Orleans Edwardian Ball makes berth on March 25th. I can’t presuppose much, but I do know, there will be artists there, and people will dance like they are free. For further information, visit their website.